Despite my recent efforts including the youtube video on how to install maps, I’m still getting a bunch of people having issues with it. I decided to make a support page for exactly that reason which can be accessed in the main menu above. It houses that video, again, and text instructions on how to install a map. From now on, all technical questions and comments regarding map installation must be asked there. I will be deleting any questions asked elsewhere. The comments on the particular map pages are for discussion about those maps only. A comment that wont be shown (But that I WILL read and fix if it is a problem on my end) are “The download links don’t work”. So if you have exhausted all the download links but were unable to download the map, let me know, and I will look into it even though your comment will not be approved. PVP maps are a whole different beast to adventure maps I am learning. I mean, I knew things like balancing would be super important in a PVP map, but I never realised how often and how much testing you actually have to do. I feel like the map is slowly getting to a place where I will be happy to release it… So far, most people have enjoyed it. When they start they say “Oh it plays sort of like Cluster Chunk” but then after about 10 minutes they start to realise what sets it apart. By the end it’s “That is a really fun map” and “I haven’t really played a PVP map like that before” which is exactly what I’m looking for, so that makes me happy. I’m just glad Vladimyr let me use his brain! Here is what the map looks like at the end of a short game. Progress on my PVP map. 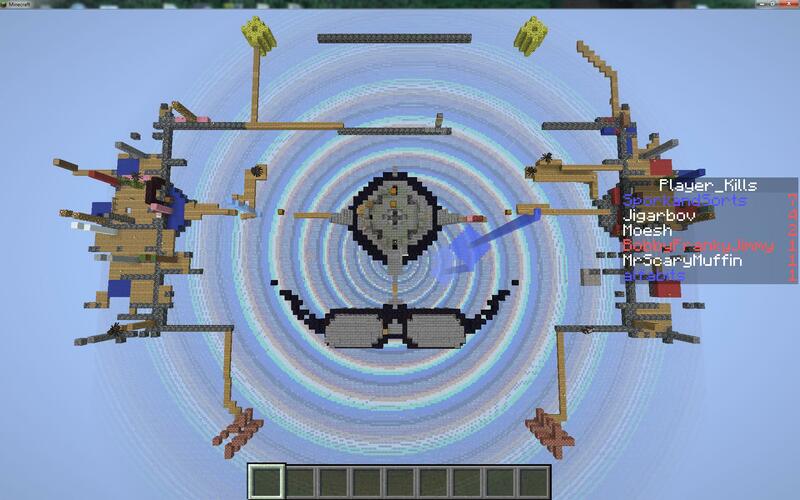 My PVP map is actually almost done. I have started beta testing it with some people who follow me on twitter and results are very positive so far. I also can’t mention this map without mentioning Sir Vladimyr. This map would not have been made without his great ideas. tomutwit captured this screenshot of the latest test… Looks nice! I got tired of people telling me there is no texture pack, or that they didn’t know how to install maps or whatever. So this is how you do it with the maps that I make. I am using Windows 7, but this method should also work on Windows Vista (lol) and probably even Windows 8. Why the background music? I don’t like my own voice and thought it could keep it a little more entertaining!